The Hamilton Company, founded by Harold Brown in 1954, celebrated its 60th anniversary while announcing the Boston-based company had reached another milestone — the accumulation of more than $1.5 billion in residential and commercial real estate assets. 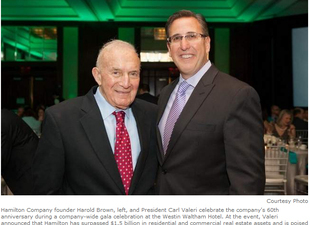 The announcement was made by Hamilton Company President Carl Valeri during a gala 60th anniversary celebration in which Brown and other Hamilton employees were recognized for their long-time contributions. Brown, now 89, told employees how and why he left a lucrative career as a chemical engineer to “dabble” in real estate, first as an owner of three doughnut shops in greater Boston, which he sold when he re-entered military service during the Korean War. After the war, Brown again began buying real estate, turning vacant basements into garden-style apartments. Brown, a resident of Brookline, recently founded the Hamilton Company Charitable Foundation, which will give millions of dollars in perpetuity to local charities and community organizations in and around greater Boston. Jameson Brown, Harold’s son, oversees the foundation and serves as the company’s vice president for acquisitions.